The 2010 Boy Scouts of America Centennial Commemorative Uncirculated Coin was released by the United States Mint on March 23, 2010. Each one dollar face value coin was designed to help celebrate the 100th anniversary of the Scouting organization in America. The Mint had only been authorized to strike up to 350,000 of the coins across all product options and demand for the strikes was strong from their initial days of release. A sell-out did occur for the Boy Scout related coins. Each coin is struck from 90% silver and 10% copper with three youth members of the Boy Scouts featured on its obverse and the Boy Scout emblem on its reverse. A surcharge on the sale of each coin has been authorized by Congress and will be used to aid the scouting efforts in hard-to-serve locations. The Mint also released a proof version of the coin. 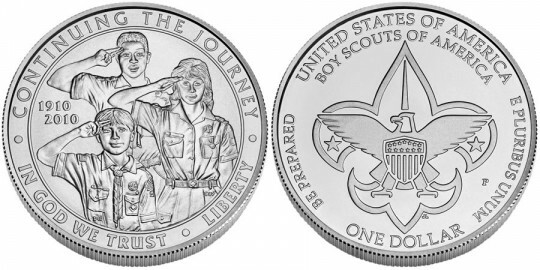 A Cub Scout, a female Venturer and a Boy Scout are all featured on the obverse of the coin representing the youth of the Boy Scouts of America organization. All are shown in full uniform and saluting. It was designed by Artistic Infusion Program Master Designer Donna Weaver and engraved by United States Mint Sculptor-Engraver Charles Vickers and also includes the inscriptions "CONTINUING THE JOURNEY," "IN GOD WE TRUST," "LIBERTY" and "1910 2010." It was designed by Artistic Infusion Program Master Designer Donna Weaver and engraved by United States Mint Sculptor-Engraver Charles Vickers. 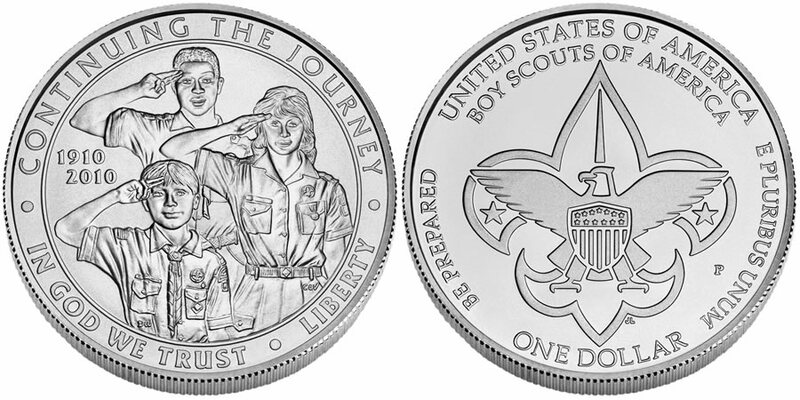 The Boy Scouts of America's universal emblem (as engraved by United States Mint Sculptor-Engraver Jim Licaretz) is seen on the reverse of the coin. Also shown are the inscriptions "UNITED STATES OF AMERICA," "BOY SCOUTS OF AMERICA," "E PLURIBUS UNUM," "BE PREPARED" and "ONE DOLLAR."